Saab 9-5 updated after criticism | What Car? Saab has updated its 9-5 executive saloon, with a range of changes designed to boost its appeal. The 9-5 Sportwagon estate version is now available to order, too. The 9-5 was launched in 2010, but hasn't been well received. 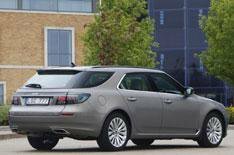 Saab has acted to address criticism of the car's ride, refinement and interior quality. Every engine has been fine-tuned for improved efficiency; on average, fuel consumption and CO2 emissions have been cut by 4.7% across the range. All versions come with a gearshift indicator, while the 158bhp 2.0-litre diesel engine now gets stop-start technology as standard. Chassis changes are aimed at making the 9-5 more comfortable and rewarding to drive. The suspension set-up for Vector SE versions has been modified; Saab says that extensive testing in the UK means that the car is now better able to deal with poorly surfaced roads. Aero models now get Saab's 'Drivesense' system, which features variable effort hydraulic power steering and suspension that adjusts according to the road conditions and how the car is being driven. Four-wheel-drive models also come with an electronic limited-slip differential as standard. Inside, there are new materials designed to give a classier look. All versions have extra metallic trim. Satellite-navigation and a DAB radio are now standard across the range, too. All of these updates will appear on the new 9-5 Sportwagon, The new estate model has a boot space that can be expanded from 527 litres up to 1600 litres. That's big, although not as capacious as a BMW 5 Series Touring or a Mercedes-Benz E-Class Estate . Prices for the Sportwagon start at 26,995 and go up to 39,195. Both the updated 9-5 saloon and new 9-5 Sportwagon are available to order now, with deliveries expected in the autumn.